New Mexico is a state of the southwest United States on the Mexican border. It was admitted as the 47th state in 1912. Site of prehistoric cultures that long preceded the Pueblo civilization encountered by the Spanish in the 16th century, the region was governed as a province of Mexico after 1821 and ceded to the United States by the Treaty of Guadalupe Hidalgo in 1848. The original territory (established 1850) included Arizona and part of Colorado and was enlarged by the Gadsden Purchase of 1853. Sante Fe is the capital and Albuquerque the largest city. Population: 1,920,000. The Clovis-Paleo Indians later discovered the eastern plains of New Mexico, the same expansive romping grounds of the dinosaurs around 10,000 B.C. The river valleys west of their hunting grounds later flooded with refugees from the declining Four Corners Anasazi cultures. Sometime between A.D. 1130 and 1180, the Anasazi drifted from their high-walled towns to evolve into today's Pueblo Indians, so named by early Spanish explorers because they lived in land-based communities much like the villages, or pueblos, of home. Culturally similar American Indians, the Mogollón, lived in today's Gila National Forest. Less than two generations after Christopher Columbus set foot on the shores of an obscure Caribbean island on October 12, 1492, and claimed this New World for the Spanish kingdoms of Leon and Castille, Spanish conquistadores such as Hernán Cortés and Francisco Pizarro had conquered the Aztec Empire in Mexico and the Incas of Peru. Subsequent explorers remained on the alert for other lands which might prove as wealthy as ones these men had conquered. It was this search for a “new” Mexico which ultimately led to the expedition which first brought the Spanish to New Mexico in 1540. In 1536, the ragged survivors finally emerged from the wilderness at Culiacan, on the west coast of Mexico. Cabeza de Vaca's report to the Spanish Viceroy, Antonio de Mendoza, included a brief mention of stories they had heard which told of large cities in the interior of the continent where valuable minerals were traded. This sparked a renewed interest in the Spanish quest to find the “new” Mexico which had so far eluded them. In 1539, Mendoza authorized Marcos de Niza, a Franciscan priest who had accompanied Pizarro to Peru, to conduct a preliminary exploration. Estevan went along as the expedition's guide. New Mexico remained under Spanish rule until 1821 when Mexico won its independence from Spain. Running from Missouri to Santa Fe, the trail opened trade with the U.S. and brought new lifestyles, money and settlers to New Mexico. In 1824, New Mexico briefly became a Mexican territory, but in 1846 U.S. Gen. Stephen Watts Kearny's troops followed Anglo merchants down the Santa Fe Trail to occupy New Mexico, which became an American territory. An 1847 revolt by Mexican loyalists precipitated battles at Santa Cruz and massacres at Mora and Taos, but eventually armed resistance ceased. The U.S. army forced the Navajo and Apache Indians onto a reservation on the Pecos River in 1886, and in the late 1880s, the railroads steamed in, forever changing New Mexico. Commerce improved, but under the imported U.S. legal system, dishonest Anglo lawyers defrauded many natives of land they had held for centuries. New Mexico is home of Philmont Scout Ranch located in Cimarron. The state of New Mexico shares an international border with the country of Mexico. The largest fire in the state's history was ignited on May 4, 2000 in the National Park Service's Bandelier National Monument, when a controlled burn meant to clear away dry brush and prevent future wild fires leaped out of control due to high winds. 25,000 people, including all the residents of Los Alamos, were forced to evacuate their homes. In 1950 the little cub that was to become the National Fire Safety symbol Smokey the Bear was found trapped in a tree when his home in Lincoln National Forest was destroyed by fire. In 1963, in Smokey's honor, the New Mexican legislature chose the black bear to be the official state animal. The father of modern rocketry Massachusetts scientist Robert Goddard whom some called a crackpot, came to New Mexico in 1930 to test rocket-ship models. From those humble beginnings the aerospace industry became one of New Mexico's leading industries. To test the latest rockets White Sands Missile Range was created on the same land where the first atom bomb had been exploded. Two important aspects of New Mexico's economy are scientific research such as the nuclear energy research carried out at Sandia National Laboratories and mining of natural resources such as oil, natural gas, uranium, potash, copper, coal, zinc, gold and silver. Saint Paul's United Methodist church in Las Cruces has 7 bell choirs. The world famous Santa Fe Opera has an open-air (outdoor) theater situated dramatically outside of the capital city in the foothills of the Sangre de Christo Mountains. The town of Deming is known for its annual duck races. Roswell the states 4th largest city was founded in 1869 when a professional gambler established a lone store on the cattle trail. 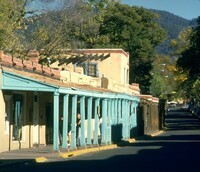 New Mexico's largest city Albuquerque was founded in 1706 as a Spanish farming community. It was named after a province in Spain. The City of Truth or Consequences was once called Hot Springs. In 1950 the town changed its name to the title of a popular radio quiz program. On the same desert grounds where today's space age missiles are tested, ten-thousand-year-old arrowheads have been found. New Mexican history has ranged from arrows to atoms and has embraced Indian, Spanish and Anglo cultures. Few states can claim such a distinctive past. New Mexico.gov - Official website. This page was last modified on 17 January 2013, at 19:19.